Introduces the reader to the three main role players in development: the community of the poor; the state; and the non-governmental sector. The text shows how the role of each has changed and continues to change in relation to the historical evolution of development thought from a simplistic modernization view to today's sustainable development paradigm. 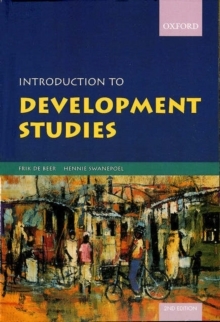 Chapters on the important development issues of health, education, food and hunger, development aid, local government and community policing illustrate the development roles in the context of development dynamics as informed by development theory. The reader is introduced to various development problems related to these issues and is led through the dynamic process of development in which the role players operate.